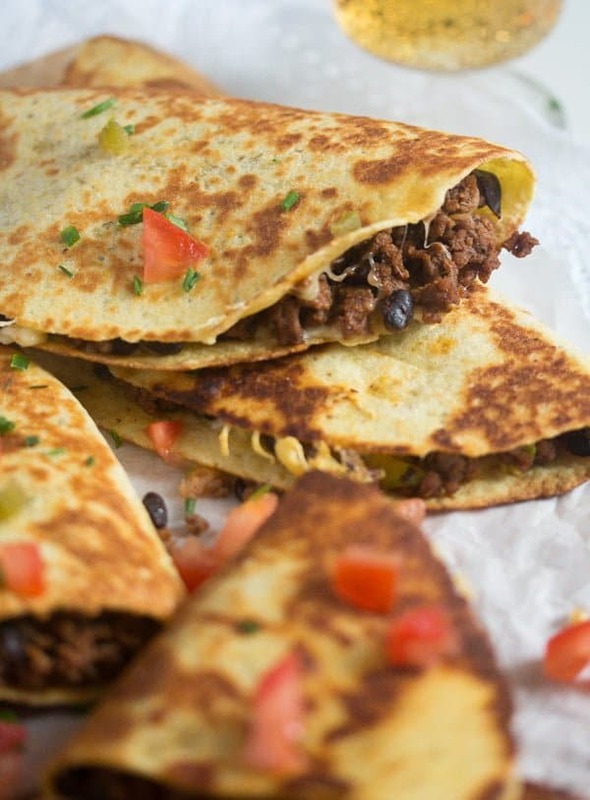 Deliciously spicy black bean quesadillas with ground beef, avocado and cheese. 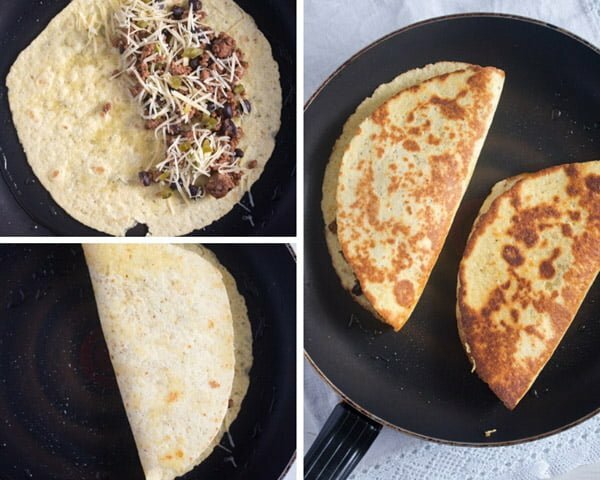 Who doesn’t love a good, cheesy quesadilla? I am not an expert in Mexican food, Mexican food is not as well-known in Europe as it is in the US, but even I know and love quesadillas. And not only quesadillas, trying new Mexican recipes has become quite a new “hobby” lately, I bought some books, searched the internet and I try one recipe or another every other week or so. Have a look at this soothing Mexican Chicken Soup, these amazing Tostadas or the Tres Leches Cake. And not to mention the tacos. My son is a fan and keeps wishing me to make tacos. This is a super simple Mexican recipe for black bean quesadillas. 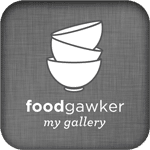 As mentioned above I bought a few Mexican cookbooks lately and although I find them very good and I love reading them, I find it very difficult to find any recipes that I can actually cook. The reason is the lack of ingredients, the typical Mexican cuisine uses ingredients I have never even heard of here in Europe and many techniques that I find very difficult to follow at home. So, I get ideas from books and turn to the internet for simplified, actually “cook-able” versions of the recipes. Kind of the same with this recipe for ground beef quesadillas. After reading a book (The Cuisines of Mexico by Diana Kennedy) where the tortillas were filled with corn fungus, pumpkin blossoms and calves’ brains (I would definitely love to try all of those fillings, but I have never even seen any of these things), I thought about making some really straightforward quesadillas filled with pretty much the same filling I use for regular rolled tortillas or tacos. 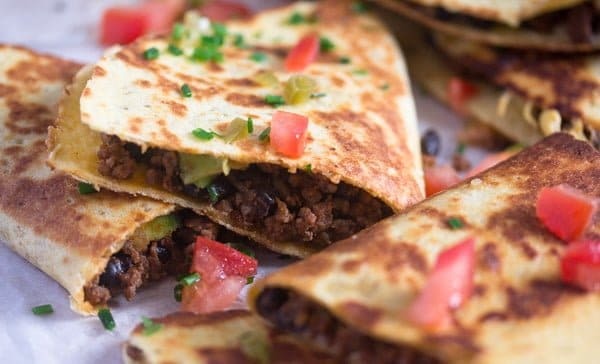 I normally use lean ground beef, but I have made this black bean quesadillas recipe with ground turkey as well. Just as delicious. I use tomato paste and water for the ground beef quesadillas most of the times. However, if I happen to have an open salsa jar or bottle in the fridge, I would definitely use that, about 4 tablespoons salsa of choice instead tomato paste and water. The tortillas available here are rather large, about 24-26 cm/ 9.4-10.2 inches diameter. If your tortillas are smaller you will need more than four for all the filling. I used Gouda cheese for my black bean quesadillas recipe, but Cheddar will do just as well. If available, you could definitely use a more authentic Mexican cheese for the ground beef quesadillas. However, Mexican cheese is not available in Germany. When it comes to the herbs, fresh coriander would be the best, most genuine option. But again, fresh coriander is tricky to get around here, so I often replace it with parsley. Chives are nice as well, I use them often enough for quesadillas or tacos, I love the extra onion flavor. 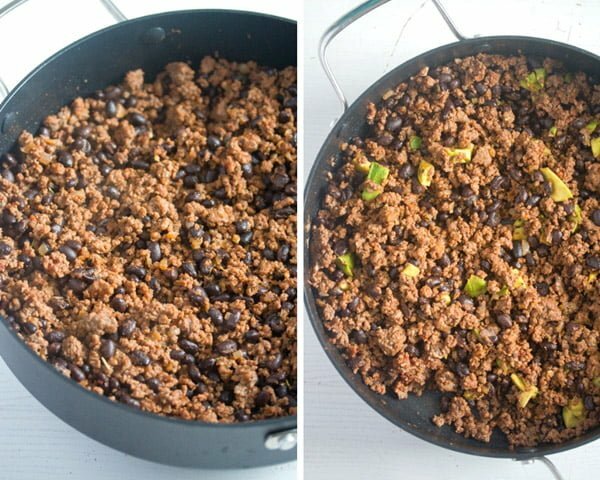 Making these quesadillas with black beans and ground beef is very easy, especially if you don’t care about making your own tortillas. Step 1: Cook the ground beef, onions and garlic making sure to break all the lumps while the meat is cooking. Add the spices, tomato paste and water and stir well. Let cook shortly. Step 2: Only add the chopped avocado and fresh herbs after removing the pan from the heat. Step 3: Brush a non-stick pan with some olive oil. Place one tortilla in the hot pan. Sprinkle half of the tortilla with some of the cheese. Cover this half with some of the beef mixture, add some more cheese on top and fold the other tortilla half over the filling. Step 4: Turn the tortilla carefully using a spatula. Fry it on the other side as well. The quesadillas should be golden on both sides and the cheese should be melting by now. Step 5: Repeat with the remaining tortillas. Definitely with some lime wedges and sour cream on the side. Greek yogurt would also be an option, it makes the meal livelier, more refreshing. I always have some tomatoes on the side or a nice tomato or corn salsa. You could make this salsa and maybe leave out the avocado, as the quesadillas already contain some avocado. 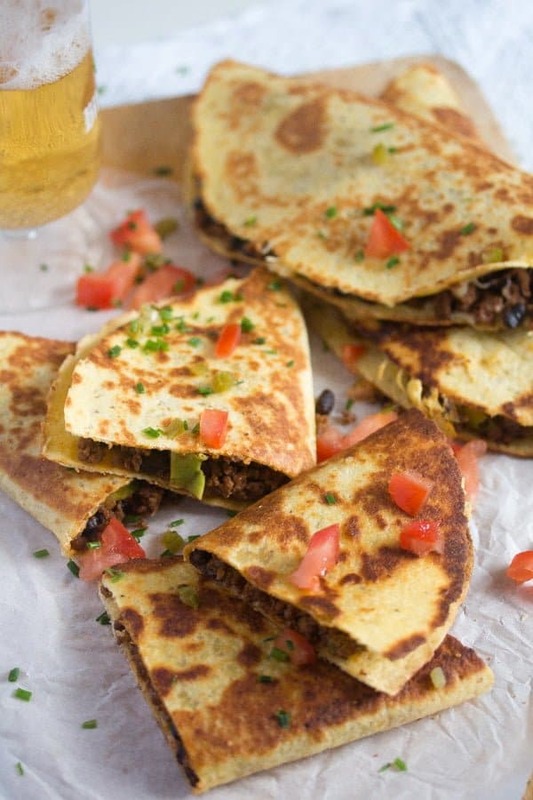 A cold beer on the side makes the ground beef quesadillas even better. Heat 1 tablespoon of the oil in a large cast iron or non-stick pan. Add the ground beef and brown it well, taking care to break the lumps while it browns. In the meantime, chop the onion and the garlic. Add them to the meat and cook for about 3-4 minutes until the onions are softened. Add the dried oregano, paprika powder, cayenne pepper, cumin, coriander, salt (½ to 1 teaspoon to taste) and pepper. Stir in the tomato paste and the water as well. As mentioned above you could replace the tomato paste and the water with about 4 heaped tablespoons of salsa of choice. Add the drain black beans. Stir well and cook on medium-low heat for about 5 minutes. In the meantime, chop the avocado. Remove the pan from the heat and stir in the avocado and herbs. Heat a large non-stick pan. Brush the pan with some of the remaining olive. Place one tortilla in the pan, add some cheese on one half of it. Top with some of the beef mixture and add more grated cheese. Fold the other tortilla half over the filling. Fry the quesadilla lightly on both sides until golden. Use a spatula to carefully turn the quesadillas on the other side. Serve immediately with tomatoes or tomato salsa, sour cream and lime wedges. Note: You could replace the tomato paste and water with about 4-5 tablespoons of salsa of choice, I always do that if I happen to have a jar or bottle of salsa in the fridge. I cook Mexican very very rarely, so I’m always glad to learn a new recipe. 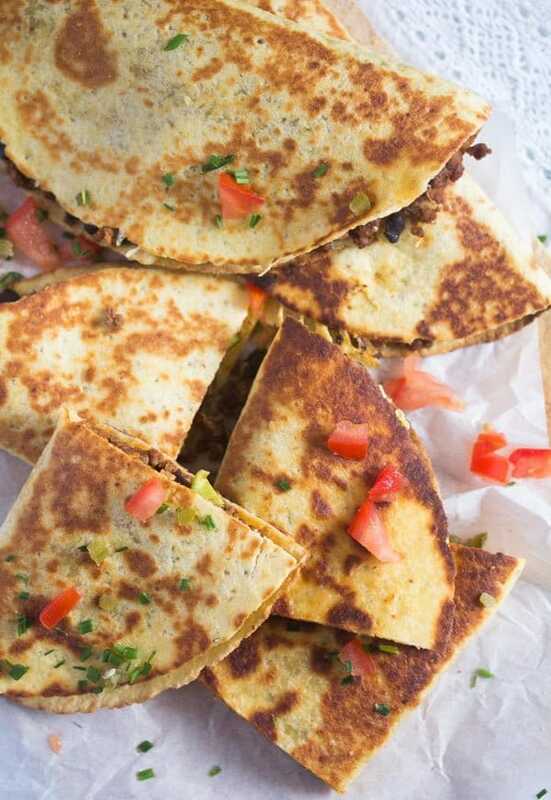 These quesadillas look absolutely delicious. I have everything to make these for lunch tomorrow!!! Quesadillas are so versatile but beans and burger is a fabulous combination. Thanks Adina for another great idea!